They've moved to a new city and don't know very many people yet. They've been in a long-term relationship and have let their social life wither. Their old friends have slowly been dropping out of the picture (moving away, busy with work or a new family, etc.) and haven't been replaced by new ones. A large chunk of their social circle disappeared overnight, like everyone graduated from university and most of their friends moved out of the city. They feel like they've grown apart from their current friends and want to make entirely new ones. In the past they were happy being alone a lot of the time, but now they want to be around people more often. They never really knew how to make friends and have always wished their social lives were better. They've recently made a big lifestyle change such as deciding not to drink anymore, and need to develop a new social circle that's more suited to it. Below are my thoughts on how to make friends. I'll cover a basic structure first, then go into some attitudes and principles towards the whole thing that I think are important. People who are already good at making friends naturally tend to do most of the things I outline below. Here are the basic things you need to do to make friends. They may seem simplistic, but there can be a lot to each point. People who struggle with their social lives often stumble on one or more of them as well. This won't apply if you've moved to a new area and don't know anyone, but often you'll already have the seeds of a social life around you. You don't necessarily have to go out and meet ten strangers to have one. It's often easier to turn existing contacts into full-fledged friends than it is to meet new ones. Acquaintances you're friendly with when you run into each other, but who you never see otherwise. People at work or in your classes who you get along with. Friends of people you know who you've gotten along with in the past. Someone who has shown an interest in being your friend but you never really took up the offer. People you very occasionally hang out with, who you could see more often. Friends you've gradually lost contact with who you could get back in touch with. For some people, cousins who are close to your age. Get into hobbies or communities where you'll naturally meet a lot of people you already have something in common with. Even better if it involves an activity that facilitates conversation. Meet people through school or your job. You'll see the same faces day after day, and can get to know them in a more gradual, low-pressure way. Meet one or two people you click with, and then get to know their friends. If you hang out with fifteen people, you shouldn't have to have met them all individually. Overall, meeting new people may require making an effort to get out of your day-to-day routine. If most of your hobbies are solitary you might also need to add some more people-oriented ones to the mix. It never hurts to just to live a full, varied, interesting life. You won't meet someone through every last thing you try, but your odds will be better than if you hang around at home all the time. Once you're in a situation with some prospective friends around, you need to strike up conversations and try to get to know them. You won't form a connection with everyone you interact with, but if you chat to enough people you'll find you like and get along pretty well with some of them. Once you've done that you could say you're now at the Friendly Acquaintance stage, or that they're context-specific contacts (e.g., work "friends"). 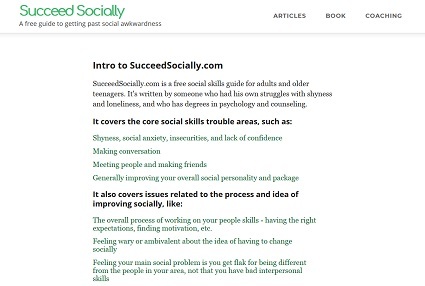 If you have trouble with successfully meeting, chatting to, and getting to know people, you may want to check out the site's sections on shyness, fears, and insecurity and on making conversation. Once you've met some people you click with, ask them to hang out and do something outside of the situation you met them in. This is an important, overlooked step in my experience. You can meet all the people you want, and they can think you're great, but if you don't take any action to do something with them in the future, then you won't form many new relationships. People will stay as the guy you talk to in class, or the girl you chat to at work in the break room. This seems basic, but lonelier people often hit a wall here. There may be someone they joke around with at work, or chat to in one of their classes, or play games with at a local gaming store, but they won't take the step of inviting them out and taking the relationship to the next level, and beyond the acquaintance or activity partner stage. If you're on the shyer side, you might be a little hesitant to invite people out. While it is a little scary at first, and there is some risk of rejection, it's fairly easy to get used to. It's not nearly as bad as asking someone out on a date, for example. Depending on how you met them, you may invite someone to hang out fairly quickly or wait a few weeks. For example, if a friend brings one of their buddies along to have drinks with you one day, and you spent four hours together and hit it off from the start, you may be totally comfortable asking them to hang out again right away. On the other hand, if you seem to mesh with someone at your job, but can only have short conversations with them here and there, it may be a month before you feel ready to invite them out. It's a good idea to get into the habit of getting people's contact info fairly early. You may meet someone interesting, but you can never assume you're going to see them around again anytime soon. Ask for their phone number or email address, or see if they're on whatever social media sites are big in your area. That way if an opportunity to get together comes up, they'll be easy to reach. Also, if they have your info, then they can get a hold of you if they want to invite you to something. To hang out with someone you've got to plan it. Sometimes the process is straightforward. You ask them if they want do something, they agree, and you set a time and place. At other times trying to nail down a plan can be tedious and unpredictable, especially when more than one other person is involved. It helps to accept that this is just an area where there's always going to be an amount of uncertainty, and you can't control everything. If inviting people out and arranging plans all seems like a big hassle, it also probably feels that way for everyone else at times. They shouldn't always have to step up and organize things. Do some of the lifting yourself when you need to. Of course, making your own plans is important, but if someone asks you to hang out, even better. If you get invited to do something, strongly consider going. I won't tell you have to force yourself to say 'yes' to absolutely everything. Like if you're certain you'll dislike an activity, it's way outside your comfort zone, or that's the only time you have to study for a big exam, it's okay to decline. However, if you're only a little unsure, give it a chance. Why turn down a free chance to get out there with people? When you've got more friends and different options competing for your time you can be more choosy. If you're more of a shy or solitary person it's easy to mull over an invite and rationalize that it won't be that fun and that you shouldn't go. Try to push past those thoughts and go anyway. You often can't be sure how enjoyable something will be until you show up and see for yourself. Sometimes you'll have to inconvenience yourself for the sake of your social life. You may get invited to a movie you only half want to see, or someone might call you up on Friday evening as you're about to go to bed, asking if you want to go out. Whenever you have two or more people in the equation, you're going to have to compromise sometimes. Again, just being out there outweighs these minor annoyances. Another thing to consider is that many people will stop inviting someone out if they decline too often. They may have nothing against the person, but the next time they're planning an event they'll think, "Paul never comes out when I ask him, so no point in letting him know this time." If you do have to pass on an invite, make sure to emphasize you're still open to hanging out another time. It's one thing to hang out with someone once, or only occasionally. You could consider them a friend of sorts at that point. For that particular person maybe that's all you need in a relationship with them, someone you're casually friendly with and who you see every now and then. However, for someone to become a closer, more regular friend you need hang out fairly often, keep in touch, enjoy some good times together, and get to know each other on a deeper level. You won't have the compatibility to do this with everyone, but over time you should be able to build a tighter relationship with some of the people you meet. Once you've made a regular friend or two you've also got a good base to work from. If you're not super social in nature, one or two good buddies may be all you need to be happy. At the very least, if you were feeling lonely and desperate before, having a relationship or two should be enough to take those feelings away. Sooner or later you'll end up meeting your friend's friends. If you hit it off with them then you can start hanging out with them as well. You could also become a member of the whole group with time. You can also continue to meet entirely new people. Having friends will make this easier as they'll do things like invite you to parties or keep you company in places where there are new people to potentially meet. If you join one new club, hit it off with three people there, and end up hanging out with two of them long term, then you've made two new friends. If you stop there then that's all you'll have. If week after week you're coming up with new ways to meet people, and then following up and attending lots of get togethers, then you'll have a pile of friends and acquaintances eventually. It's up to you when you feel like stopping. There's no law that says everyone has to have dozens of people in their social circle either. Many people are perfectly happy only having a few really close relationships. If you only have a couple of friends and decide you want more though, you can always get out there again. Above I outlined a basic structure of Meet People > Hang Out With Them > Keep Hanging Out > Repeat. Now I'll go into some broader concepts that apply to making friends as a whole. I think the points below are just as important as the stuff I've covered already, if not more so. A huge principle when it comes to building a social life is: Take Initiative. It's a big mistake to passively wait for other people to do the work of befriending you. It's great if it happens, but don't count on it. If you want to get a group of friends, assume you'll have to put in all the effort. If you want to do something on the weekend, don't sit around and hope someone texts you. Get in touch with various people and put something together yourself, or find out what they're doing and see if you can come along. Don't worry too much about seeming desperate or needy. Wanting friends means you're a regular, social person, not some weirdo. Take the attitude that it's about you and you'll do what needs to be done to build a social circle. Who cares if a handful of people think you're a bit too eager along the way if it all eventually works out? It's a lot like dating or trying to find a new job. What you get out of these things depends a lot on how much you put into them. Other people are often harmlessly thoughtless and preoccupied in the sense that they'd be happy if they hung out with you, but they wouldn't think to ask you themselves. Sometimes you have to take an interest in them before you appear on their radar. Similarly, some people are more lax and laid back than you'd like about returning your emails or calls. They're not consciously trying to reject you. They're just a little more loosey-goosey about that stuff than most. If you're inexperienced with making friends, you may see the process as being more drawn-out and complex than it really is. Often all you have to do to make a friend is meet someone you naturally click with and hang around with them enough. You also don't have to know them for months before applying the 'friend' label to them. One characteristic of more social people is that they'll throw the word friend around pretty loosely when describing their relationships. But it almost becomes a self-fulfilling prophecy. Sure, if you've just met someone it may not be a deep, intimate relationship, but you can still hang out with them and have a good time. If you're lonely your initial goal should just be to get some sort of social life going. Of course, steer clear of anyone who's truly toxic. But if you meet someone who seems nice, but they're not your 100% ideal friend, you should give them a shot. The benefits of being out socializing, as opposed to moping around at home, outweigh the fact that they're not your perfect match. At the very least, it's easier to make even more friends when you've already got a few. Also, if you're forming your first-ever social circle, you probably don't totally know what you like or want in other people. You have to see what different types of people are like in a friend capacity firsthand. As a general rule, if you more-or-less get along with someone, actually become friends with them first, and then decide if you want to be friends. If you're picky, you can come up with reasons not to befriend just about anyone ahead of time. But when you're already hanging out with someone, and you've skipped over your pickiness, you often find you like their company, even if they wouldn't have been good 'on paper' in your mind beforehand. I also give this advice because studies show lonely people tend to be more negative about others in general. Less-naturally outgoing types can also be more picky about who they choose to spend their time with. If you tend to be down on everyone you meet, you need to make an effort to consciously override these feelings. Plus, don't have an skewed self-image that demands you can only hang out with a certain caliber of people. Be realistic about yourself and your circumstances. If you don't totally like yourself you may also be averse to hanging around people who you see as too similar to you, as it can act as a mirror that reflects your shortcomings back at you. This may be justified if you have some irksome traits and understandably want to avoid others who have them, but often you may be turning away legitimately good people who just happen to have some characteristics that tweak your insecurities a little. Sometimes you'll join a club or be introduced to your friend's friends and hope to meet a bunch of great new people. Then you get there and the experience is disappointing. You may feel like you don't jell with anyone, or like they're ignoring you in favor of making in-jokes with each other. Give these groups a few more tries. Often you're limited in how much you'll connect with others on the first meeting. You may warm up to each other before long. If someone refuses your invitation because they're busy or not sure if they can make it out then don't give up. Try again another time. Try to assume the best. Don't jump to the conclusion that they hate you and you're fundamentally unlikable. Also, even the act of making an invitation sends the message that you like someone and want to hang out with them. They may be unable to meet that one time, but now see you as someone they could possibly have fun with in the future. When you meet potential friends be realistic about your importance in their lives and how long it may take to become buddies with them. They probably already have a social circle and their world won't end if it doesn't work out with you. As such, don't get too discouraged if they're not knocking down the door to hang out with you a day after you met them. They may be busy and your plans may not pan out for another few weeks. Sometimes it just won't work out with someone. You'll get along at the time, and they may express an interest in hanging out in the future, but for whatever reason things don't materialize. They may be too busy, already have enough friends, or they don't think you're a good enough match for them. It happens to everyone and is nothing to get too down about. Keep the bigger picture in mind and continue meeting people. 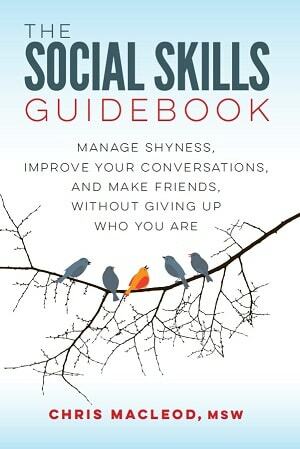 In the right situations you can build a new social life really quickly, like if you've just moved to a new city to go to college, or if you join the right club or team and instantly click with everyone there. At other times it takes longer for things to develop, but stick with it. It may take a while before you get a chance to meet some people you're compatible with. After that, it may be a few months before you're consistently hanging around with each other. It may be a year or more before you feel like you're really, really friends with them. It often takes time to go from having no plans, to having plans with the same person every third weekend, to having plans with a variety of people three times a week.